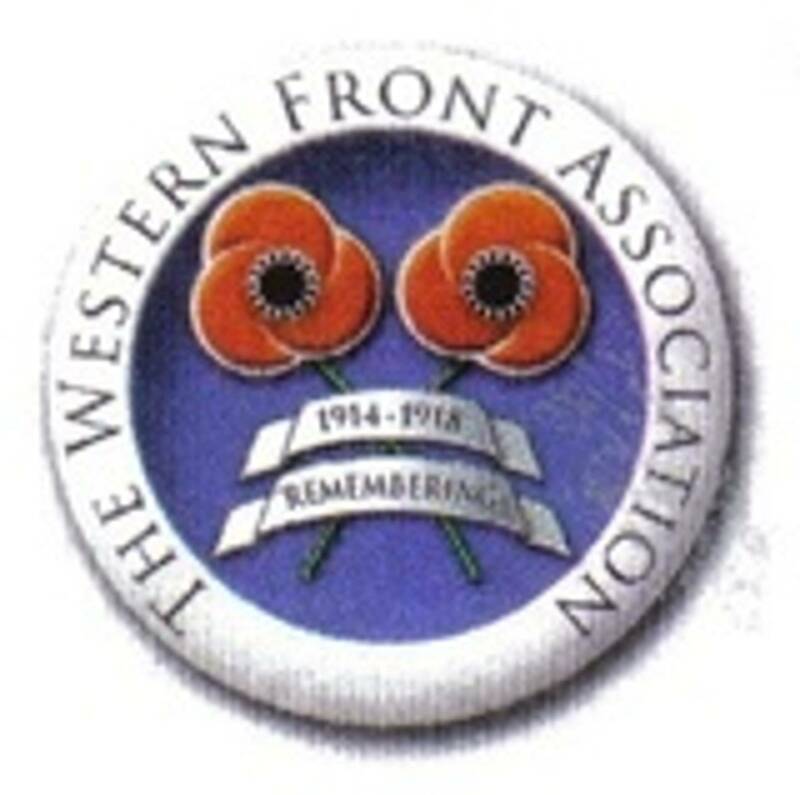 Dublin Western Front Association - 15 October, 1916/2016. Branch Meeting, 15 October, 2016. Killed in Action, 15 October, 1916. James was born in Ballyclare, Co. Antrim, he enlisted in Belfast, at which time his residence was given as Whiteabbey, Co. Antrim. 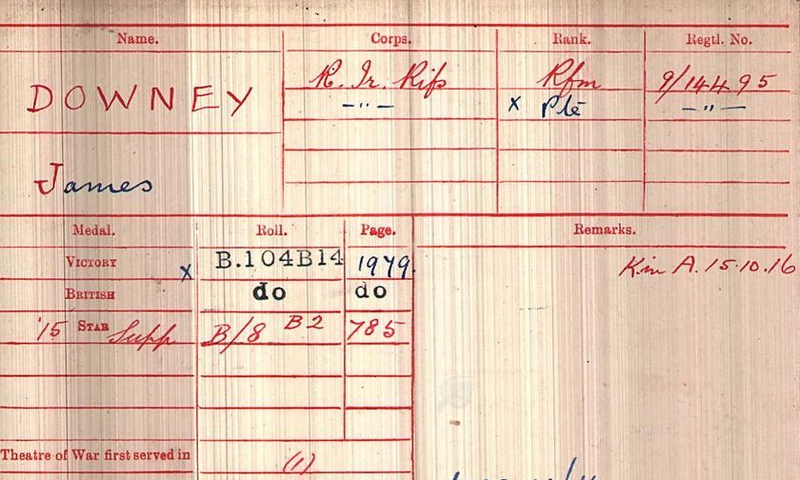 The battalion was formed in Belfast in September, 1914, from the Belfast Volunteers, and while we don’t know when James enlisted, it seems fair to assume that he joined up early in the war, given that he landed in France/Flanders on 7 July, 1915. It’s worth noting however, that the rest of the battalion did not move to France/Flanders until the beginning of October,1915, where it was part of the 107th Brigade, 36th Ulster Division. The battalion War Diary shows that at the beginning of October they were in the Neuve Eglise area and went back into the trenches on the 12th, the records show that James was killed in action on 15th October, the only entry in the War Diary for that day states, “The C.O. returned today”. 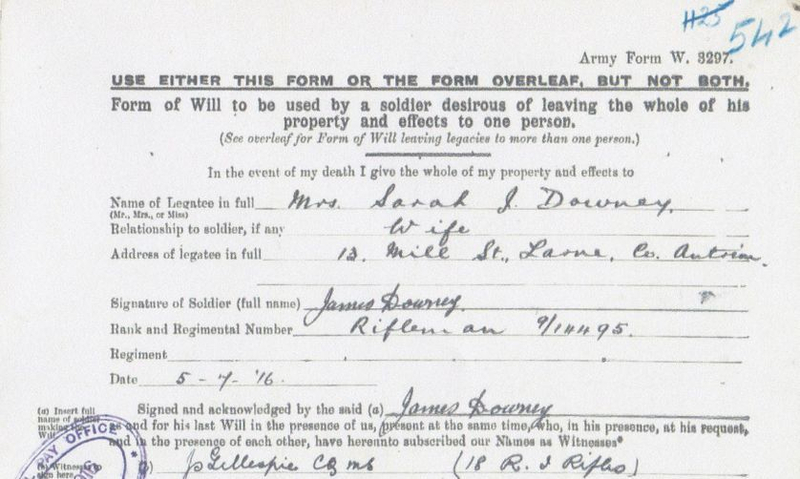 James' will survives and from that we know that he left a wife, Sarah, of Mill Street, Larne, Co. Armagh. James was entitled to the 1914-15 Star and the British War & Victory Medals. He is buried in the St. Quentin Cabaret Military Cemetery about 10.5 Kms south of Ypres near the village of Wulvergem.